Auch Font­Shop hat die Zei­chen der Zeit erkannt und bie­tet künf­tig Schrif­ten an, die sowohl von der Bild­schirm­dar­stel­lung als auch von der Lizen­zie­rung her spe­zi­ell zur Ein­bet­tung in mobi­le Apps gedacht sind. 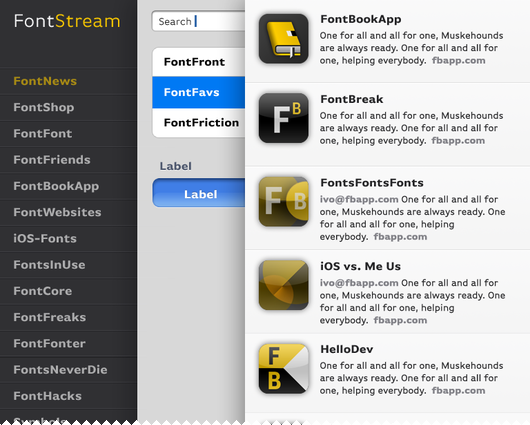 Mobi­le Font­Fonts are spe­ci­fi­cal­ly for­mat­ted for embed­ding into an iOS app. No more hours spent con­ver­ting fonts! Each is opti­mi­zed for per­for­mance on screen and fea­tures deve­lo­per-fri­end­ly licen­sing and pri­cing. Licen­sing for Mobi­le Font­Fonts ser­ves the needs of the deve­lo­per. Zunächst gibt es die Mobi­le Font­Fonts für App­les iOS, sprich iPho­ne, iPad sowie iPod touch. Dabei wol­len es die Ber­li­ner aller­dings nicht belas­sen. Alt­hough initi­al­ly avail­ab­le only for use in iOS app deve­lop­ment, mobi­le fonts for addi­tio­nal plat­forms will be released in the com­ing mon­ths. The­re are also plans to release addi­tio­nal font fami­lies, so desi­gners can use typo­gra­phy to crea­te tru­ly 360-degree brands across desk­top, web, and mobi­le. Alles Wei­te­re steht auf www​.mobi​le​font​fonts​.com.